This comic took forever. I started working on it early last week and didn’t finish it until the day before it had to go up. There’s just a lot of stuff that’s happening I guess. I tried to draw the Lich King a bit more accurately this time. I think he looks much better. Except for the spikes on his helmet. Hmmm. That bow is called Arrowsong. I saw it drop in Heroic Naxxramas a few runs ago. This entry was posted on Friday, April 17th, 2009 at 12:00 am and is filed under Comics. You can follow any responses to this entry through the RSS 2.0 feed. Both comments and pings are currently closed. 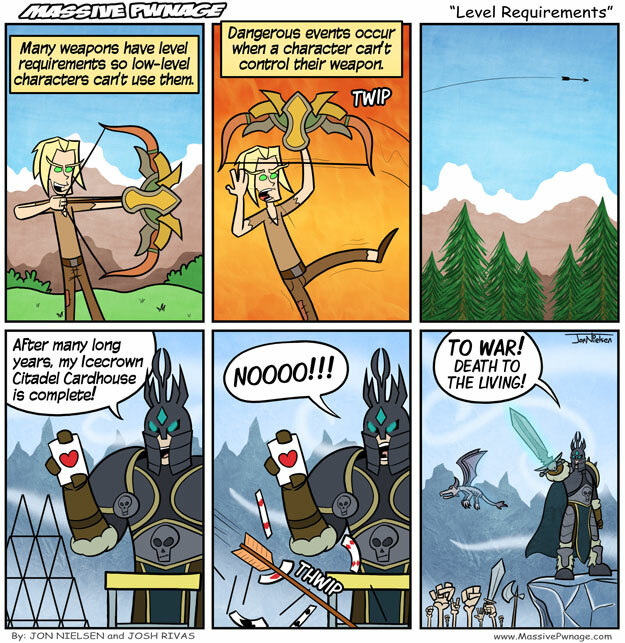 I was hoping this comic would shed some light onto what the heck the Lich King was doing after the events of WCIII. I lol’d, it explains so much!